← This is the way. It is almost always the case that I’m wearing my dressing gown and one-armed – therefore lopsided – glasses when I put my beans to soak. This is because the beans are slumped next to the coffee, tea, neglected herbal bags (mango passionfruit and vanilla – as hideous as it sounds,) a very peculiar chicory drink I bought when I was pregnant and not thinking straight and the Green and Blacks hot chocolate in the kitchen cupboard. I’m probably slumped up against the kitchen counter in much the same way as my legumes are against the tin of Earl Grey tea when I catch sight of the beans. They stare back, both appealing and reproaching. ‘Two months woman, two months and without so much as a dusting!’ And so as the Moka rattles to its delicious climax and the milk warms in the pan, I tip my white, brown or mottled beans into my largest tin bowl and then cover them with water. On Monday morning it was pearly white coco beans that skittled into the bowl. 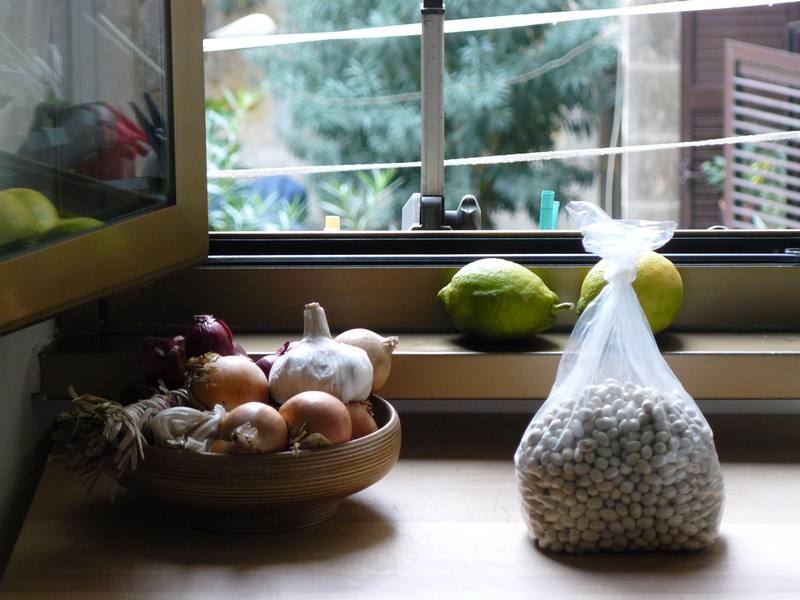 Coco beans bought from Giovanni and Assunta Bernabei’s Stall at Testaccio farmers market with Mona. The stall with the sign that reads ‘My name is Giovanni Bernabei. Ever since 1983, I made a pact with myself to touch no longer with my hands any fodder, fertilizer or any chemical products whatsoever. So long as I have the strength to raise a hoe, I will labor for those who believe in me and appreciate my produce.’ Needless to say, Giovanni is one of my food heroes. 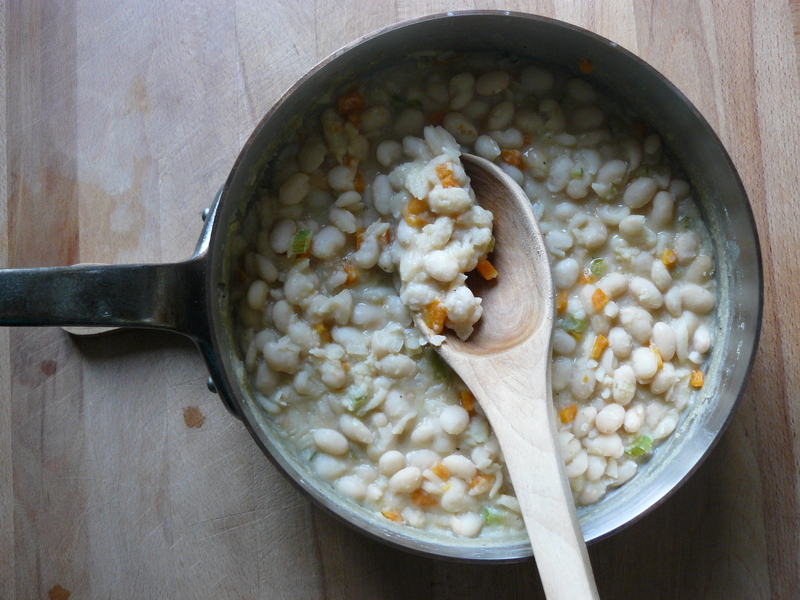 On Monday afternoon I cooked the beans, letting them lumber to the boil and then shudder away burping every now and then for about 4o minutes until they were soft, tender and surrounded by an opaque pool of unassuming bean broth. Unassuming but inimitable. 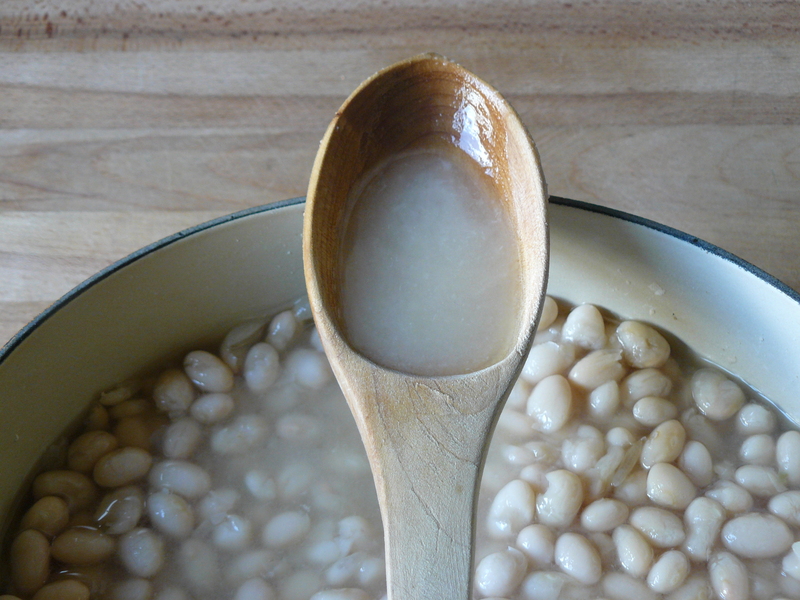 This cloudy spoonful is the other reason I buy fresh beans or good dried ones and then soak and cook them myself. This cloudy, starchy, richly flavored liquid is the ingredient that makes bean soups, stews and dishes like pasta e fagioli taste so good. I learned the hard way. Vincenzo made a very odd noise and then buried his head in his hands for some time on observing me slosh the bean water down the plug-hole and then rinse the beans. I think he might have called me a barbarian. He shook his head repeatedly during lunch. I’ve never made the same mistake again. I used a slotted spoon to remove the first meal’s worth of beans. They were still warm with just enough of the bean water clinging to them to keep them moist. Olive oil, crumbled salt and a twist of black pepper were all they needed. Beside my heap of soft white beans, I had seven black olives, half a small ball of mozzarella and three radishes. Then yesterday – Tuesday – having been struck by an uncharacteristic but almost overwhelming desire for plump, pink sausages – I think one of my neighbours early morning cooking sessions might have curled up my noise and into my food consciousness or maybe it was just my hormones – I decided a thick bean braise, a bed of beans if you like for under my bangers was in order. I took, as I often do, a well trodden path. Please forgive me if this blog is starting to feel a little a like a bean deja vu! I took an onion, a clove of garlic, a carrot and a stick of celery. I peeled, diced and then sautéed my harlequin heap in extra virgin olive oil until it was extremely tender, golden and – with much of the water sautéed away – intensely flavoured. I added the beans and their precious broth, a generous pinch of salt and three twists of black pepper. I let the pan bubble and burp discretely for about 15 minutes. The beans were ready long before my fat, cheeky-pink sausages from Sartor were. Fortunately for me, beans are forgiving things and perfect for someone with shoddy kitchen manners and awful timing. Both the beans and sautéed vegetable benefited no end – rather like me at about 3 0 clock – from a little rest. 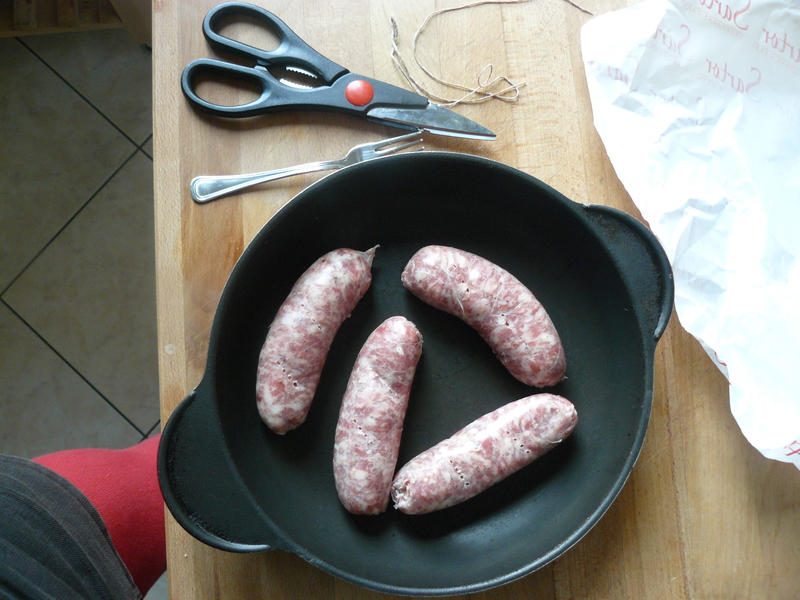 I cooked my sausages in the oven, pricking them with a fork first and then roasting them for about 40 minutes or so. Once my sausages were burnished and smelling pretty irresistible, I pulled them from the oven. I gently warmed the beans, noting they needed another ladle of bean broth in order to achieve the right consistency. That is: thick enough to provide a comfortable bed, but still soft and very spoonable. Warm bowl, a bed of beans and two fat sausages, Lunch. Now you may well note the absence of half a sausage on my plate. Three slices were eaten whilst plating up – yes I did work in the hospitality industry, 1988 – 90 at Harpenden Moat House: grim weddings, depressing family gatherings and budget Sunday roasts were a speciality – and yes I did burn my tongue. Sausages and beans, how do I like thee? Let me count the ways. 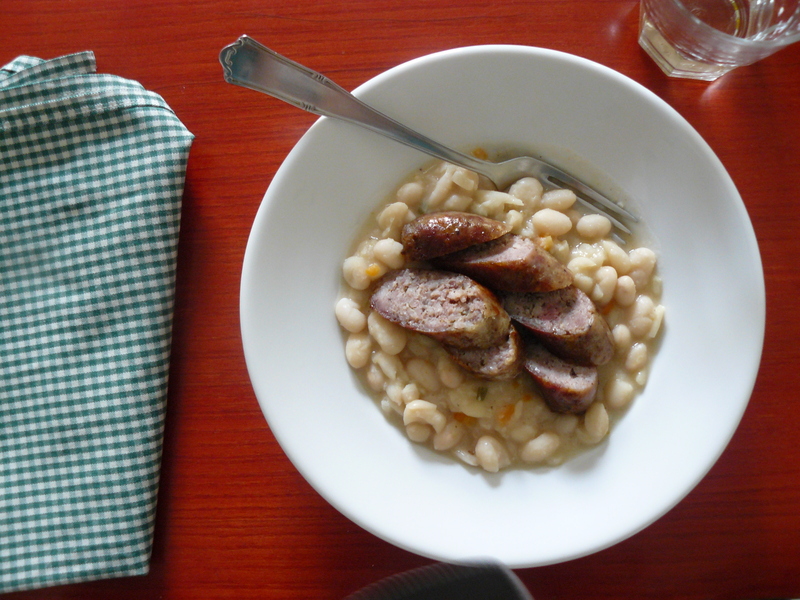 This is such a good plateful: the soft, nutty beans contrasting brilliantly with the fat pork sausages. Ben, Dan W, Harriet and C°, Dan Gunn in Berlin this is one for you. The beans I used were this season’s, so only semi dried. I probably could have got away with not soaking them, However Assunta suggested I soaked them in cold water, drained them and then simmered them gently for just 40 minutes. Older, drier beans might have needed and longer soak and boil. As beans vary so dramatically, it’s difficult to give definitive advice! I suggest some experimentation, after all, the quest for good beans/ well cooked and a fine bean broth is one well worth undertaking. Peel and very finely dice the onion, garlic, carrot and celery. In a soup pot or deep sauté pan warm the olive oil over a modest flame and then the diced vegetables and a pinch of salt. Saute the ingredients, stirring and turning them regularly, until they are very soft and golden which should take about 15 minutes. Add the beans and their broth to the pan, stir and then – still over a gentle flame – let the beans bubble away gently for another 10 or 15 minutes. You may need to add a little more bean water/broth. Taste and season again if necessary. Serve the beans in a shallow bowl topped with two sausages. Eat. Che buono . . . perfetto per questi giorni piuttosto autumnale. Thanks for the idea and the method. Soaking now. It is a good one for these cooler days (even though today was surprisingly warm again in Rome, I am continually confused as to what to wear). Hope things are going well in your new world. That is so nice to hear, thank you. So funny, because I almost wrote the same post with the exact same beans bought (I guess) shortly before you arrived at the market! Very good you photographed yours. I got lazy, and just ate and ate. Wish I had some leftovers. I’m just sorry I missed you. Wow what beans! Oh, gorgeous. What I wouldn’t give for a bag of semi-dried beans. And though I fully recognize the gloriousness of the sausages, your first beany meal has me almost hypnotized. I see a bit of soaking and simmering in my future. I think I might have enjoyed the first meal more actually. Same which make me feel reassured as Jody is clearly a wise and talented chef. I do a bit of skimming too. If the beans are not so great I might add a bay leaf, a stick of celery and a carrot. Rachel, I do enjoy the casual way you weave in little quotes. Browning’s is a particular favorite (often mistakenly attributed to Shakespeare). The university I attended has a lovely library dedicated to the Brownings and holds much of their works. Giovanni sounds like a real salt of the earth type; I am touched by his evident sincerity, especially when so many people are all pomp and show when it comes to real food. It is so nice when people catch the detail. I must admit I attributed it to S until I was corrected. Giovanni is a good man, he is also a chatterbox! i saw him talk the other day at the presentation of the soup book, they could not get him to stop rambling. All very amusing. Hope you are ALL well. I don’t think you even have to post a recipe [yup, love this one!] – your delicious writing would make one come back again and again . . .
You see that is so nice to hear, I wish i could send you a bag of beans. Yes to bean deja vu! I will take that any day. I love repetitive-ish sounding posts– reminds me that things like beans are important, and must not be kept out of one’s sight too long! And the lesson I got from this post: I should have some Italians near me whenever I cook so they can shake their heads at me and tell me what my cooking is missing. Beans matter. 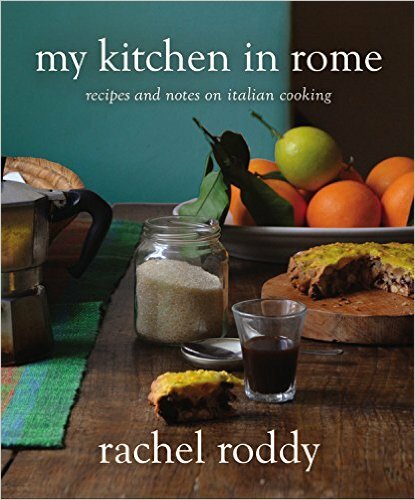 I had an italian peering over my shoulder as I made the pasta e broccoli today – a bossy, knowing nightmare. I really appreciate a good pot of beans cooked this way, but have not been able to get it right- something about living at high altitude (5,500 feet). I’ve made a goal to get this straightened out soon. Maybe a pressure cooker is the answer? We’ll see. That is high! Beans may suffer but i imagine the views are stupendous. I would love sausages over beans. It’s such a lovely and simple meal. Waiter, waiter, what IS this? Why, it’s bean soup, sir. I don’t care what it’s been, what is it NOW?! Hahaha I like your dad. Dear Rachel … you never fail to inspire and amaze. I think I would eat just about anything you wrote about, so I’m not sure whether it’s your writing or your recipes that keeps me hooked. Fortunately, you offer the combination. Tomorrow’s expedition to the San Lorenzo market will include beans and sausages … oh, and chicken. Your previous post had me drooling all the way across the pond! I love your bean recipes. So inspiring. And your pasta e ceci is my new favourite dish. But I have a question to ask you: Could you tell me what chicory is (it is used in several recipes in Zuppe) – is it dandelion leaves or more like a lettuce head? I’m not sure I can get the same variety here in Denmark. pasta and ceci – one of my faves too! Hi Eva, I wish it was 35° here! It took a while but autumn has definately arrived here in Rome. It’s my neighbour’s early morning pancetta frying that really gets me going. I read this post and then ran to get my Zuppe (RSFP) book off the shelf. I then made a long list of all the soups and stews I want to make this fall & winter. Troubled by finding the perfect beans I started with the cauliflower soup, which is smooth and satisfying and certainly bound to be a staple in my kitchen. I’m going to keep my fingers crossed that one of the Italian vendors at the farmers market tomorrow will have beans worth buying. I doubt they will compare to Giovanni’s beans, but maybe I’ll get lucky. And thank you for tip on the bean soaking liquid, apparently I need more Italians in my life (doesn’t everyone?) because I’ve been dumping it right now the drain. Oh and I’ll definitely be buying sausage – that I know I can find in this Wurst loving city. Wonderful post as always Rachel! Hi Talley, please apologise my intruding – but I think it’s the cooking liquid you should use, not the soaking liquid which contains toxins. The cooking liquid is delicious. though. oh, yes, eek, I did mean the cooking liquid! I hope I didn’t screw anyone up. Thank you for jumping in Agnes and Rachel to correct my mistake. And thank you for the pumpkin soup recommendation, I think I might try that tomorrow. Pumpkin cake and pumpkin soup, it’s going to be a nice Sunday. I imagine it might also be your style to have an almond biscuit (a little soft one) after with your espresso. Rachel, what a discovery finding your blog!! I’m an Italian born in Scotland and would give my eye teeth to find some ‘real’ pork sausages here, you made me so jealous haha!! Hi Evie – I am just planning my next trip to scotland (In May.) I am always a little intimidated to have Italians reading but it is extremely nice to have you here. Rachel, will your trip include Edinburgh?? Maybe you could bring me some sausages LOL!! 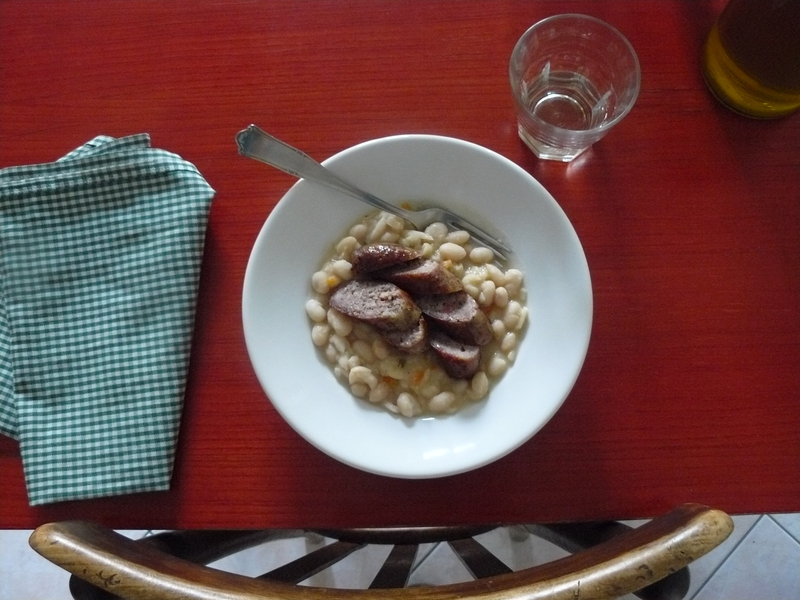 The simple things are truly the best- sausages and beans- yum. Thank you for reminding me of why I should buy dried beans rather than the canned variety. I agree. That said canned of beans are brilliant kitchen staples but mean we miss out on the brilliant bean broth. So many things had me nodding. My beans often look at me balefully – and that’s usually when they get dunked in water. I love to read what you write, Rachel. Your writing’s like your kitchen table with it’s crushed linen – simple, beautiful. The beans are on the final simmering stage right now and it is delicious! I can’t wait until it is done!